Every cinephile has gaps in their resumes. Films they feel they should have seen but have not. The classic movies that inspire many of today’s films and pop culture references are often known only by reputation or by famous snippets. In this feature I will attempt to fill in my own gaps, while keeping in mind the modern viewer and how the films might interest them. In the last entry of Filling in the Gaps we looked at one of the quintessential early screwball comedies in Bringing Up Baby. While now remembered as one of the great early comedies due to its groundbreaking pacing and immense star power, at the time the movie was a complete flop. Director Howard Hawks claimed that he had gone too far in escalating the craziness of each character and vowed to not make that mistake again. While Bringing Up Baby is most definitely worthy of its classic status, the lessons Hawks learned from that film caused him to refine his comedic directing and resulted in the superior His Girl Friday. 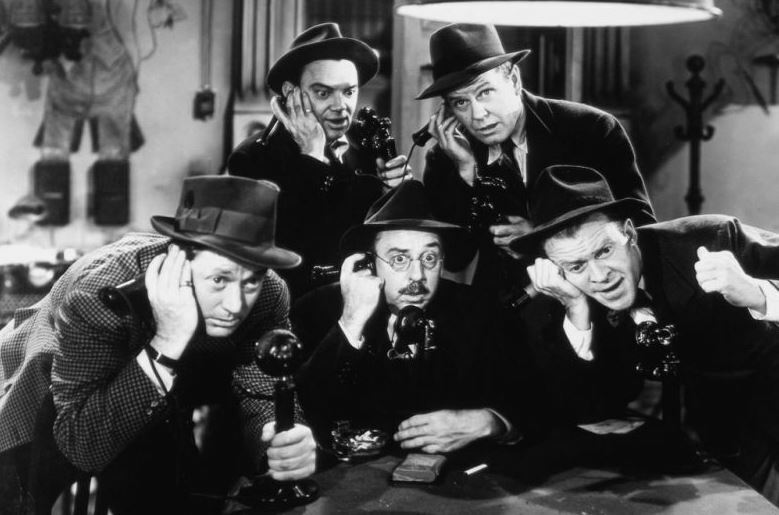 Where Baby’s chaotic craziness was unhinged and erratic, His Girl Friday was refined into an expertly crafted orchestration of speed and wit. 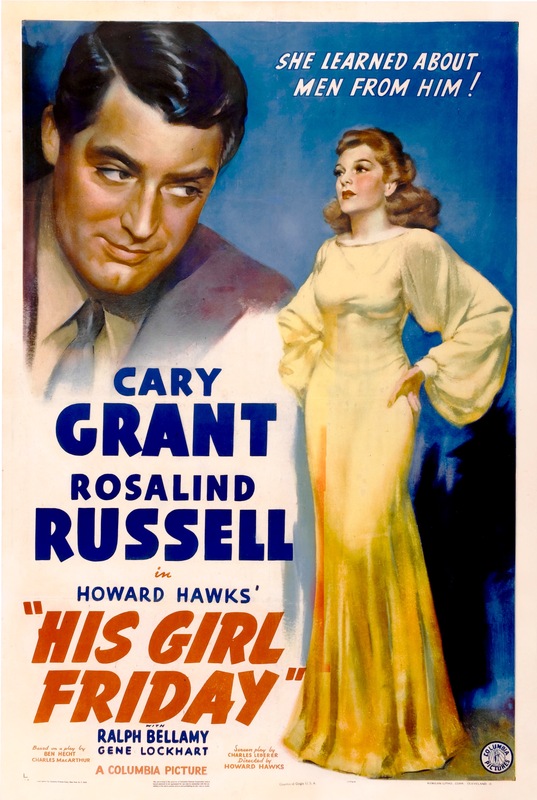 His Girl Friday is an adaptation of the Hecht and MacArthur stage play, The Front Page. But in a a bit of inspired genius Hawks decided to gender swap the lead of the film and turn this story of fast talking newsmen and add a romantic tension that brings a lot of the films chemistry. 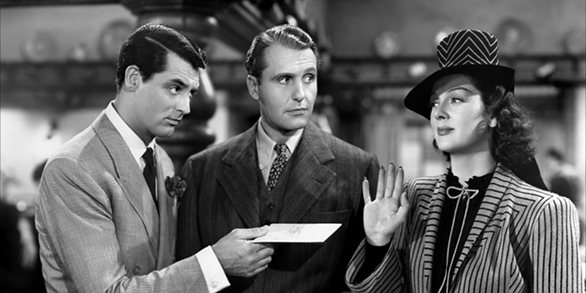 His Girl Friday is the story of a former reporter Hildy Johnson (Rosalind Russell) who is trying desperately to start a new life with her new fiancée Bruce. When she stops in at the offices of The Morning Post to inform her editor, and ex-husband, Walter Burns (Cary Grant) of this life change she is sucked into one last story. The plot follows Hildy’s efforts to get the story of a soon to be executed convicted murderer whose death is being expedited due to political pressure, even though it seems he is mentally unfit to be killed by the state. And while that plot is compelling on its own, the soul of His Girl Friday lays in the dialogue, the skill of the actors to read it at speed, and the revolutionary new approach Hawks uses for filming the comedy. What Hawks brought to the film that was unique was both the pacing and the style of the jokes. Like Bringing Up Baby there is an intense speed to the dialogue that can make each conversation feel like a roller coaster. But the magic is really in the realism of that dialogue. Hawks decided that to make the conversations seem more realistic he was going to add two facets to the scenes. First his actors would be instructed to ad lib jokes and witty retorts to make the dialogue seem lifelike. Also, actors would talk over each other, interrupt each other, and cut off sentences just as you would in a real life argument. While these things seem like obvious choices for realism today, at the time it was groundbreaking and it lends a very modern feel to the film making it very easy to watch for fans of modern comedies where these tools are used quite frequently. The film is also uproariously funny and engaging. It’s a short movie, but it flies by even faster than its run time even though lengthy scenes are staged in single rooms with nothing but the characters’ wit to entertain you. But it is that wit that makes this movie great. The dynamic between Grant and Russel is so engaging you are likely to just be happy to watch their back and forths continue with no end. Tim Levers is a contributor at MNN, a devout worshiper of cinema, and a life-long movie geek. Sci-Fi/Fantasy, Action, Drama, Classics, Horror. Love them all. All genres have the ability to produce a great film.